Produced by Janet Yang and screened at the New York Asian American International Film Festival (among others), Shanghai Calling is a humorous, thought-provoking feature debut from director Daniel Hsia. It stars Daniel Henney as Sam, an ambitious Asian American lawyer sent to Shanghai on a temporary assignment to manage a high-profile technology intellectual property case. Sam is a typical "Ugly American" -- rude, ignorant about other cultures, self-serving, and Anglo-centric. During his time in Shanghai, Sam meets fellow American expats and local Chinese co-workers. Fang Fang (Zhu Zhu) and Awesome Wang (Gang Le) work with Sam and share local stories about courtship and materialism in fast-changing Shanghai. Donald (Bill Paxton) and Brad (Sean Gallagher) are American expats who take Sam under their wing and help him adjust. Finally, Amanda (Eliza Coupe) is a relocation specialist who Sam spends time with. The film shows China from the point of view of someone who has never been there (Sam), and in the process, the audience learns about Shanghai through unique situations. ‘Shanghai Calling’ uses some effective foils and parallels to highlight Sam’s complete disconnect with his heritage, inaccurate cultural assumptions, as well as the lives of American expats. Amanda’s expat daughter refuses to speak English at home, even with her mother, because her classmates all speak Mandarin (a phenomenon many Asian Americans are familiar with). Expat Brad speaks fluent Mandarin and has a thing for Chinese women, while Sam is the opposite. Finally, Donald’s experience as mayor of Shanghai’s “America-town” raises interesting questions about at what point expats become Chinese immigrants, as well as the increasing numbers of "modern immigrants" that now move to China. Daniel Henney delivers a solid performance and is supported by a strong cast, and fans of Shanghai Kiss will likely enjoy Shanghai Calling. Ramona Diaz's documentary Don't Stop Believin': Everyman's Journey was the opening night film at the San Diego Asian Film Festival (SDAFF). It follows the remarkable story of Arnel Pineda, a singer from the slums of Manila who became the new lead singer of Journey, the legendary band with over 70 million records sold and the most downloaded song of the 20th century (‘Don’t Stop Believin’). Pineda was discovered on YouTube by guitarist Neil Schon, who had spent hundreds of hours searching for a lead singer after Steve Auguri lost his voice, before ultimately inviting Pineda to audition. The film chronicles Pineda’s first year touring with the band, as well as his life history. Arnel Pineda always had a talent for singing, and as a teenager in Manila sang for food to support himself and his siblings, who often found themselves homeless or living with extended relatives. He had nearly given up on his dreams when Neil Schon unexpectedly reached out to Pineda’s friend, who had uploaded his performances on YouTube. The film includes the original, out-of-the-blue message from Schon, which Pineda thought was a joke. 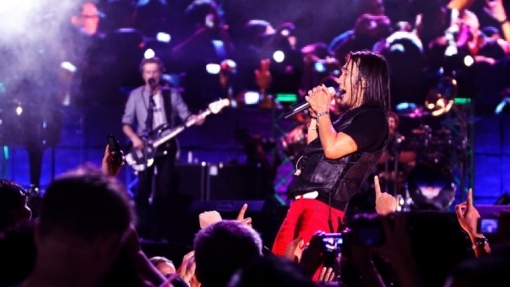 The documentary even unearths Pineda’s original audition with the band. Pineda is genuine, honest, and shares his anxieties and perceptive awareness of the dizzying situations he is thrust into. In one moment, he openly wonders if longtime Journey fans will accept him because he is Asian. While one fan is expressed that she wished Pineda wasn’t Asian, and with other critics writing him off as a second-rate karaoke singer, other Journey fans found it refreshing that the band became more global and multi-cultural. Pineda garnered a huge following in the Filipino community, with one bodyguard on the tour calling him the Filipino Elvis. Diaz shared in the post-screening Q&A that aside from Neil Schon, the other band members were distant and skeptical during Pineda's audition -- and even during the first few months of their tour. Ultimately, Pineda won over the rest of the band through his generosity and raw talent. Pineda became a living embodiment of Journey’s most famous song. Alvin Lin was born in Taipei, Taiwan and hails from New England. He blogs about Asian American pop culture, film, music, literature and politics, as well as relevant news around the world. He also writes for Imprint Talk. Alvin has degrees from Cornell and MIT.